Your investment Portfolio should really be about High Returns, no excuses! MarketsFlow's sophisticated platform helps improve your portfolio returns even in highly volatile markets. * Capital at risk. Past performance isn't a guide to the future. See detailed disclaimer notes. Most financial advisors and asset managers passively manage portfolios. This means that your investment portfolio is usually made up of pre-defined asset allocations. Is this a problem? Yes, it is. Markets are inherently dynamic in nature. This means that at any given time period, a sector of the market maybe trending upwards or trending downwards. Similarly, not all stocks are co-related or exhibit the same momentum behaviour. This is where Marketsflow shines, have a look at our monthly portfolio performance for the last 4 years. You will notice that we have consistently outperformed S & P 500 and Eurkea 50 Hedge Index. Not only is the portfolio performance impressive, but the volatility and risk management is exemplary too. 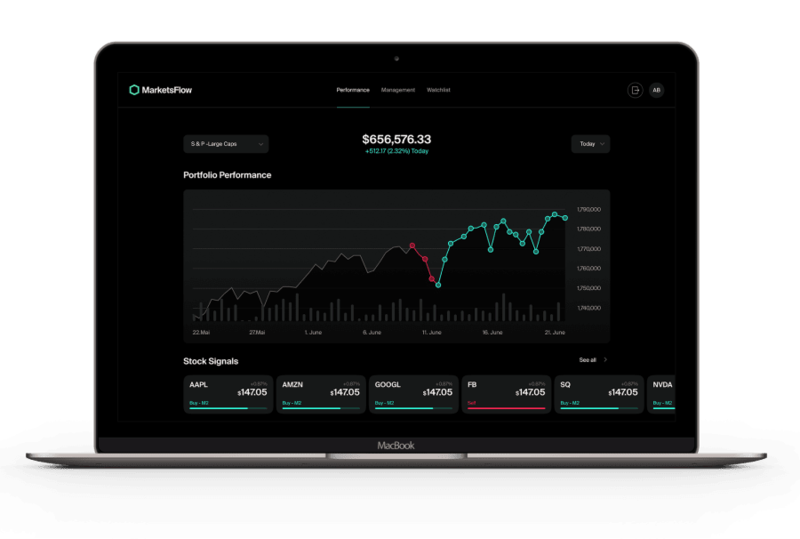 Our clear USP is our game changing platform which uses supervised Machine Learning, AI, high data synthesis and complex algorithms to help us optimally construct portfolios, make allocation and rebalancing decisions. It is this relentless focus on scientific investment management, which has led Marketsflow to outperform the markets in different conditions, including highly volatile periods. After you sign up to Marketsflow, you will receive a login to our award-winning platform and to Schwab (our Custodian and Broker). You will then be able to see your bespoke portfolio, with individual equities, and daily buy and sell signals. You will also see daily detailed portfolio performance metrics for your portfolio along with full transaction history. Marketsflow has won Best Broker-Dealer Research at the prestigious Fund Technology and WSL 2018 Awards in New York for the second year in row. Marketsflow is an SEC-registered investment advisor and, as such, we are obliged to act in our clients' best interests at all times. Using our cutting edge platform, we help design your optimal portfolio construction, and manage execution of your portfolio trades with our team of highly talented and qualified portfolio managers. As our managed portfolio client, your investment account is held under your name with our established custodian Schwab. We work with clients to ensure that their portfolio matches their investment return goals, taking into consideration their annualised investment returns and risk profiles. With regular reviews, we help ensure that your investment portfolio is meeting and delivering on your financial goals. This product is for traders who would like to professionally mange their portfolio positions and trades. The platform provides automated buy and sell signals based on your chosen portfolio construction. The signals strengths help you execute your trade position sizes, and rebalance when the market conditions change. The platform provides the rigor and discipline needed to outperform the markets, maximize your stock returns and manage risk exposure during volatility. As our self-managed portfolio client you can use your existing broker or setup as our advisor client with Schwab brokerage. Watch the video of our industry leading platform for optimising returns and risk management..
Are your ready to have your portfolio managed for optimal performance And Risk Management?